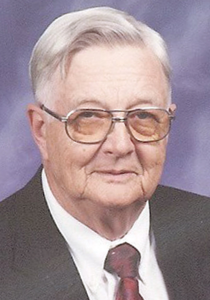 Eugene Vallandingham McFarland, 90 of rural Tipton County, died at 3:43 a.m. on Tuesday, January 29, 2019 at IU Health North Hospital in Carmel. He was born on December 16, 1928 in Goldsmith, Indiana to John Thomas & Cuba Karleen (Walker) McFarland. On December 31, 1948 he married Patricia Lucille Fausett and she preceded him in death on July 20, 1991. He then married Patricia Thomas on April 24, 1999 and she survives. Eugene was a retired livestock buyer and Poland China Breeder. He attended Hills Baptist Church. Eugene was a member of Pickard Masonic Lodge #690, a Past Master of the Masons and a member of the Scottish Rite. In 1988 he was awarded the Honorary Hoosier Farmer Decree by Indiana FFA Association. He was also a member of Tipton County Livestock Breeders Hall of Fame. Eugene helped many 4-H and FFA members with Livestock Judging. He is survived by his wife, Patty; three daughters, Cheryl Ann Hansard and husband Kit, Fishers, Indiana, Karen Elizabeth Powell and husband Steve, Tipton, Beverly Jean Stewart and husband Gary, Frankfort; five step-children, Darlene Boyer and husband Larry, Kirklin, Marcia Freeman and husband Keith, Kirklin, Carlita Wyrick and husband David, Tipton, John Thomas and wife Sherry, Brownsburg, Lorinda Huffer and husband Bill, Windfall. Eugene is also survived by five grandchildren, Scott Crouch McFarland, Michael Crouch and wife Erica, Gregory Powell and wife Cara, Kyle Powell and wife Charlene, Courtney Fredenburg and husband Travis; a granddaughter-in-law, Sondra Stewart; nine great-grandchildren, Angelica Crouch, Nathaniel Powell, Allison Powell, Riley Powell, Cooper Powell, Lillian Stewart, Isabella Stewart, Drew Fredenburg, and Alex Fredenburg. He was preceded in death by a grandson, A.J. Stewart and a sister, Mary Rovena Stowers. Eugene’s funeral will be at 12:00 noon on Saturday, February 2 at Young-Nichols Funeral Home, Tipton, with Pastor Charles Cole presiding. Burial will follow at the Elwood City Cemetery. Visitation will be also on Saturday from 10:00 – 11:45 a.m. at the funeral home with a Masonic Service at 11:45 a.m.
Memorial donations may be made to Tipton 4-H Council, 1200 South Main Street, Tipton, Indiana, 46072.